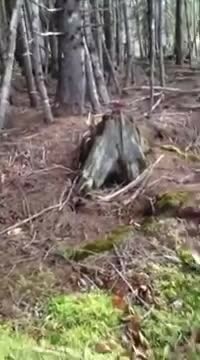 A Nova Scotia man out for a walk caught a strange phenomena in the forest near the ocean’s edge. Thankfully, he pulled out his camera to record it. In the video, Brian Nuttall captures the forest floor, rising and falling as if “breathing”. “As I entered a patch of trees spared from clear cutting, I noticed the ground moving,” he says of the incident, which has since gone viral. After posting the video, many commented that what appears as “breathing” is actually the root systems under the trees is loose and shifting. The natural phenomenon is called soil liquefaction. The solidness of the soil is reduced because of water saturation (and possibly air), which causes the visual effect where it appears that the soil is moving. The scientific explanation doesn’t make it any less dramatic to watch, as you’ll see for yourself in the video below!